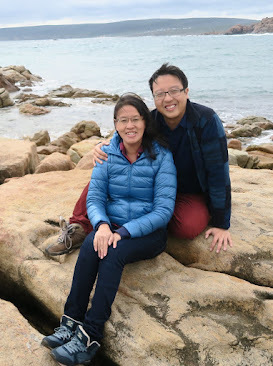 One of the things I hope to do in this blog is to share some of the activities we do at home which could easily be replicated by anyone who is looking for ideas on what to do with your young children. There are a multitude of ideas on Pinterest, but the materials may not always be available locally and may sometimes need to be adjusted for our climate, e.g. homemade dough. Here's the first installment in our series! I was so excited about this idea when I shared it last week on our Facebook page. It can be found at the One Perfect Day blog. I was excited to try it for our Little Hands to Heaven Unit 3 on the Letter "C". I have chosen to do "C is for Cookies and Cupcakes" this time round. 1. 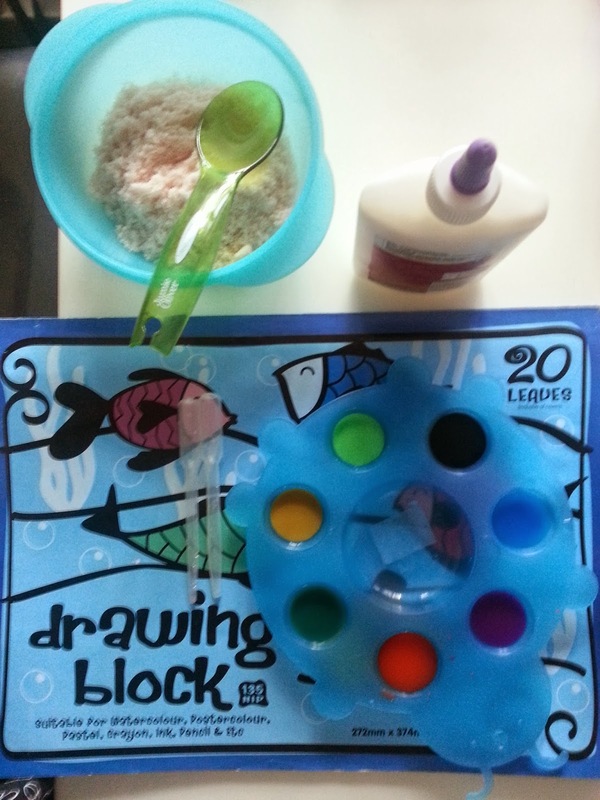 Place the drawing block onto the baking tray. 2. Using the craft glue, make patterns on the drawing block. As we have been learning the Letter "C" this week, I did a "C" first to demonstrate and also to aid in his letter recognition. 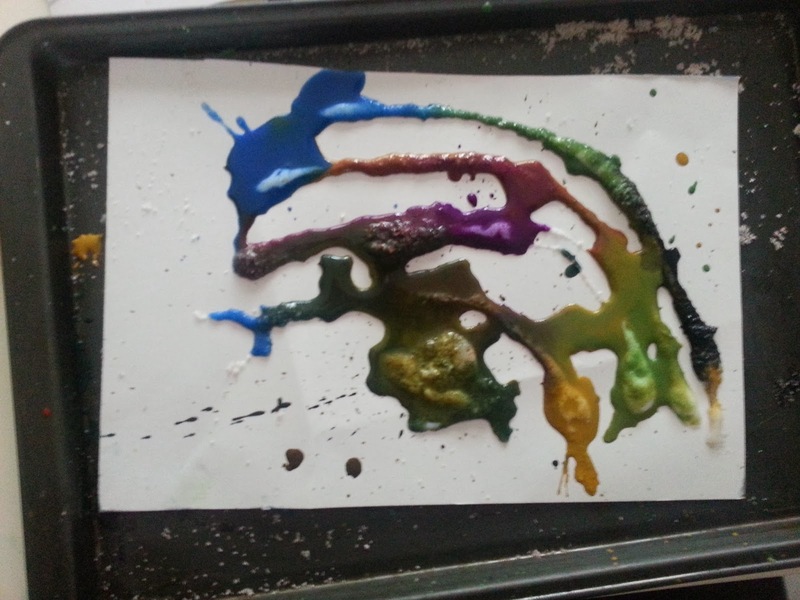 Z did a second picture with a rainbow. This was fun for the younger brother too! 4. Shake the excess salt off onto the baking tray. 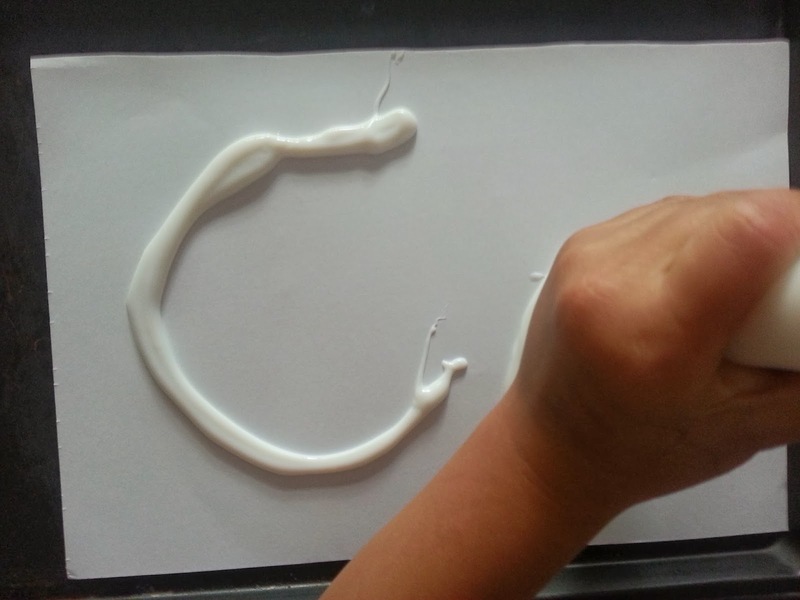 Steps 1-2: Making a "C" with the craft glue. Step 3: A liberal sprinkling of salt. 5.Using the medicine dropper or a paintbrush, drip just a few drops of watercolour paint onto a section of the glue pattern. It is important not to use too much paint or you will get rivulets of paint running across your painting (as we discovered!). 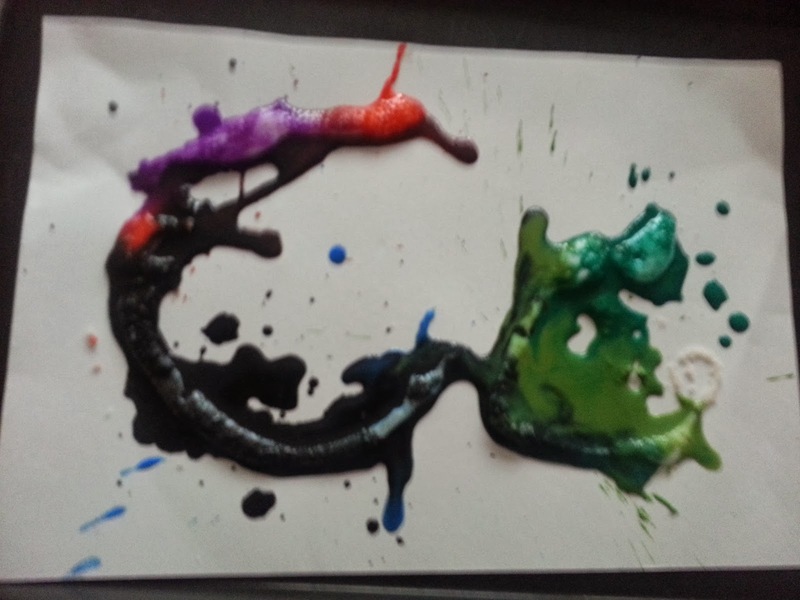 I would actually recommend using a paintbrush instead of a dropper as Z had difficulty controlling how much paint he squeezed out of the dropper. 6. This is the magical part! 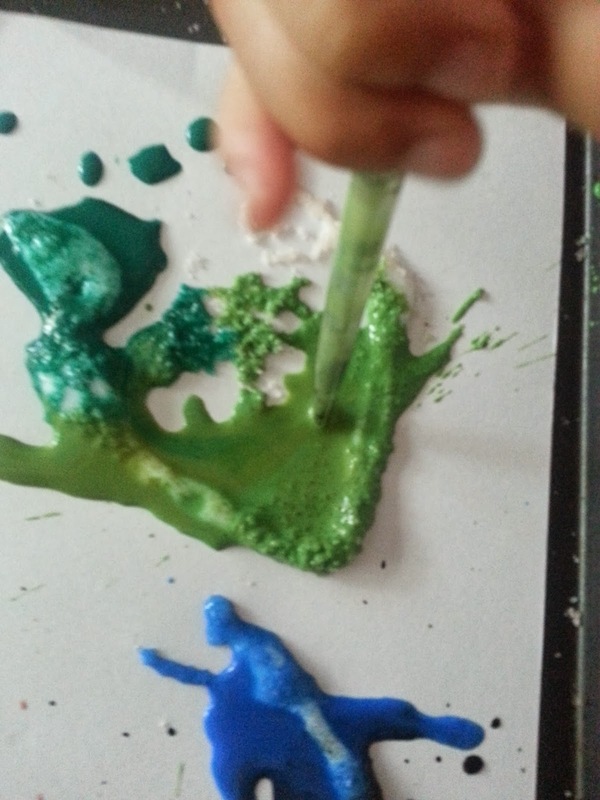 Wait and see how the paint colour travels along the glue pattern. Have fun predicting how far it will travel. It is quite a beautiful sight to behold! pattern and watching how it spreads. 7. Repeat again with another colour till the entire glue pattern is covered. 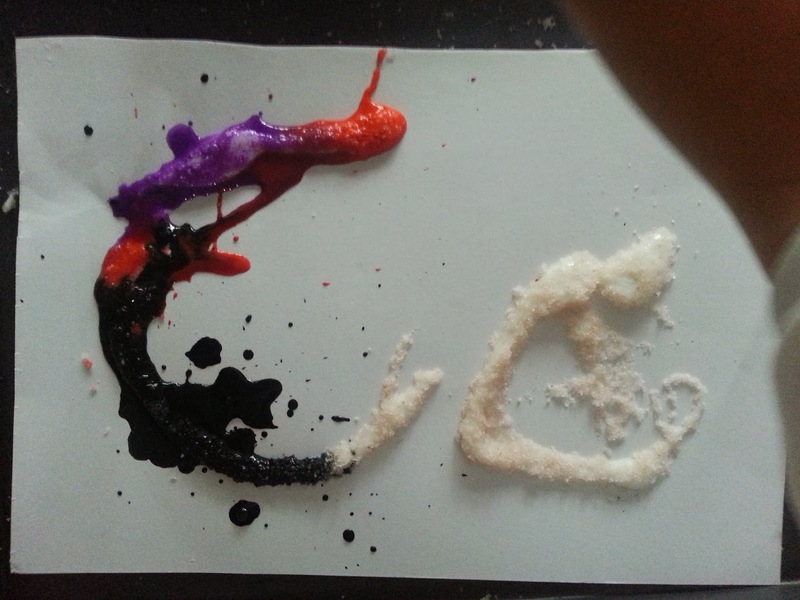 Step 7: Adding colours to the salt-crusted "C"s.
8. 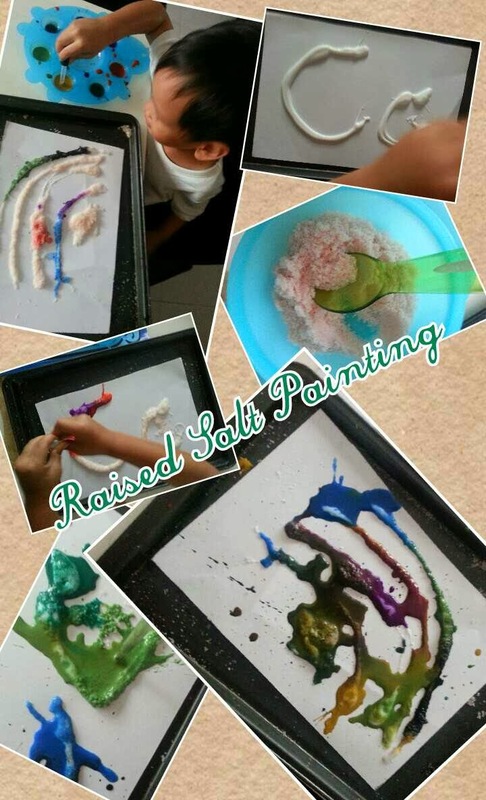 Let your beautiful raised salt paintings dry. Step 8: The finished product. 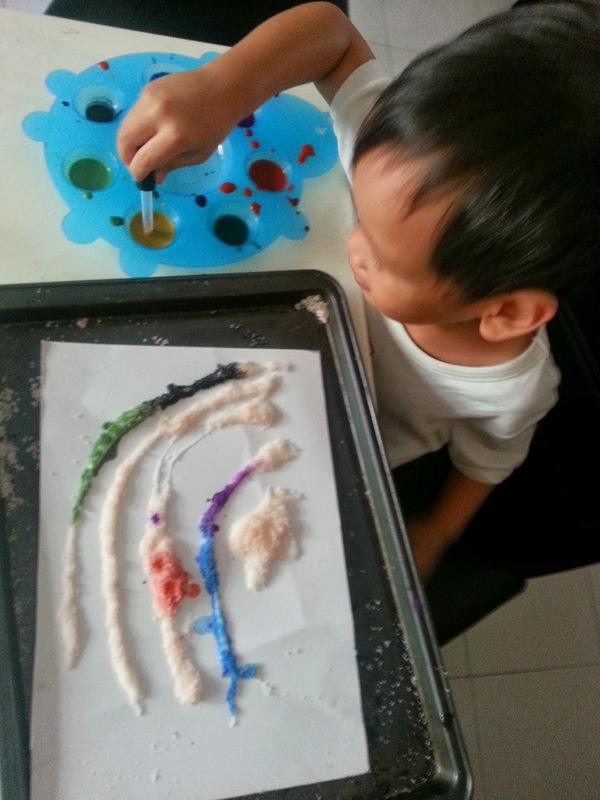 This activity involved a lot of different steps which a 3-year-old finds fun, like squeezing out the glue, exploring the texture of salt ("Is it sandy, Mummy?" he asked.) We can talk about different textures and how salt is used to flavour food. We even put a little on our tongues for a taste test. 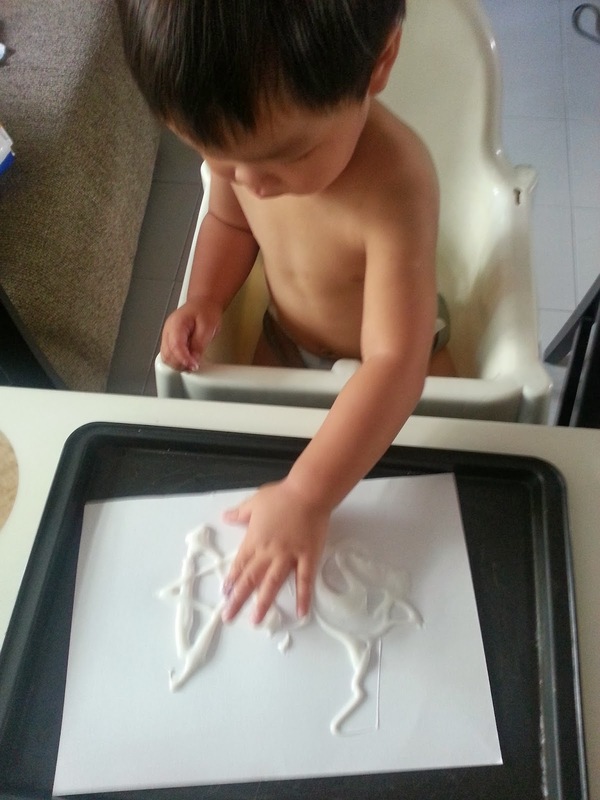 It's also great for fine and gross motor skills: squeezing, scooping and pouring. 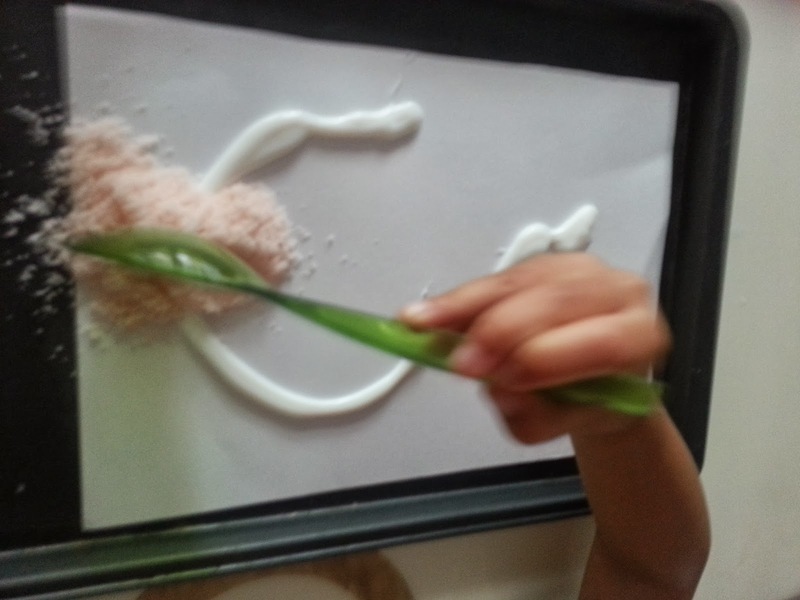 It provides one of children's first experiences in prediction and estimation of volume (a smaller amount of paint will cover a smaller surface area). Best of all, it was fun and kept our son meaningfully occupied for a good forty minutes, and the final product was beautifully textured! Wait till it dries to admire the vibrant colours and textures, but be mindful that the salt painting will not keep, so take lots of photos before it disintegrates. 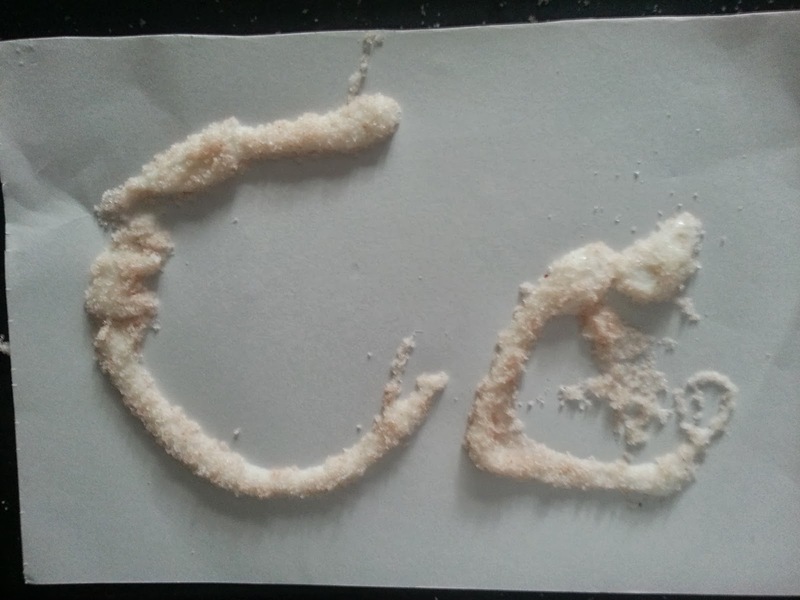 Have a salt-licking time trying it out at home!